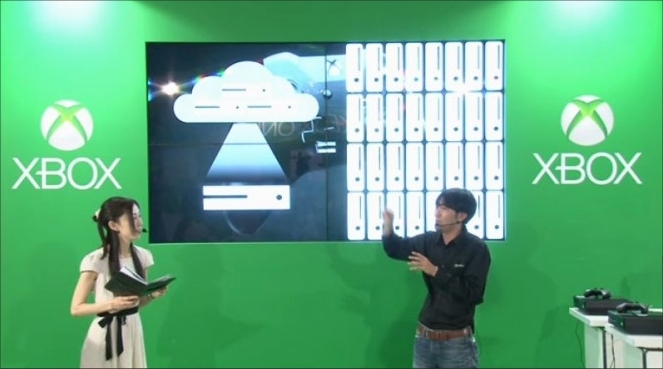 During a presentation in for the Nico Nico Chokaigi 3 festival at the Makuhari Messe in Chiba, near Tokyo, Microsoft talked up the power of the Xbox One courtesy of the cloud. According to Dual Shockers, the company stated that with the cloud, the Xbox One could be as powerful as the combined processing power of 32 Xbox 360s. Roughly making the Xbox One four times as powerful as it is without the cloud. The image below gives you an idea of what they were talking about during the event. That's a bold claim right there and it's one Microsoft is continuing to use in order to gain some kind of marketing ground over the competition. 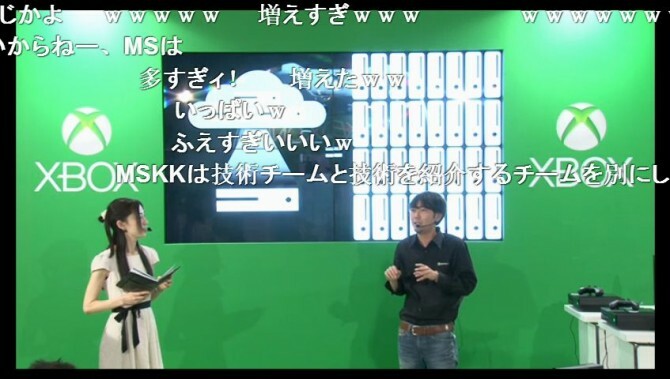 Funnily enough, another image shows the response of the Japanese gaming audience who was watching the live-stream, after witnessing the very audacious claim, with Dual Shockers interpreting that all the 'w' characters on the screen in the image below are the Japanese equivalent of typing 'lol'. That's a lot of laughing out loud. There's a clear reason for it all, though. A lot of people who may not be familiar with the way tech works will easily see or read or hear about Microsoft's “power of the cloud” and think “Wow, that's cool!” In reality there are stark limitations and restrictions on how that claim can actually be utilized in a real-world environment. 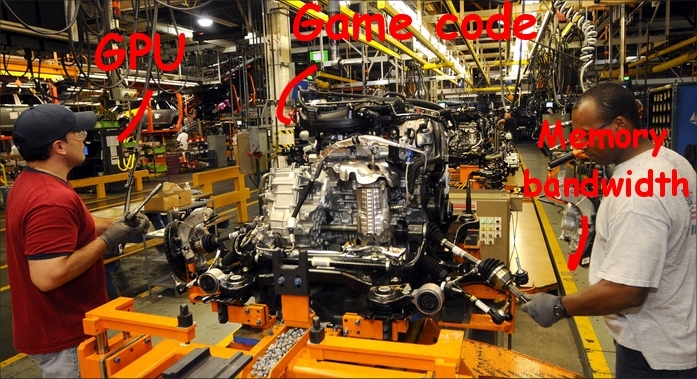 For example, imagine for a second that game processing is like a factory line at an auto-plant. Imagine that the GPU (or graphics processing unit) are the line-workers, putting together the parts on the conveyor belt and moving it along. Imagine the parts are the pieces of the game that has to be rendered, and imagine that the conveyor belt is the GPU's memory bandwidth (which determines how quickly things are put into and taken out of memory). Also imagine that the machine that puts the parts on the conveyor belt is the CPU. They all work together to create this synergistic harmony to create a car at the end of the line... the car being the final image of the game rendered to the screen. Now imagine that there's this magical new machine that operates from the ceiling. It can drop down any car part at any point on the conveyor belt, right to the line workers, exactly where they need it. It effectively cuts down the work required by the CPU machine to feed the conveyor belt new parts. The only catch is that the ceiling machine – we'll call it “The Cloud” – is feeding the conveyor belt these parts from another plant halfway around the world. An operating manager is required at both plants, and they have to communicate with each other to ensure that the right parts are being sent to the right places on the line. This sounds like an ideal way to cut down on the CPU machine feeding parts to the line, but “The Cloud” is limited by the operating manager's phone line (which would be equivalent to a user's internet connection speed). Sometimes it's fast and sometimes it's slow. If the operator from the plant building the cars calls to get a certain part, but the phone line is slow, the part may not arrive in time and it'll end up messing up the workers on the line. If the operator doesn't receive a reply in time, it will mean that a part may not arrive for the workers and that part might be missing on the final car. “The Cloud” is ultimately dictated by how fast the operators will be able to communicate, and any slip-up in communication will affect the car's final performance. That above analogy is exactly how it works with “The Cloud” in real life. It's an intermediary function that Microsoft is promoting as a way to increase the potentiality of the Xbox One's overall capabilities. However, just like in the analogy above, internet bandwidth is the major issue. The connection speed of the end-user will dictate how quickly information is pinged and sent to the hardware. If the connection can't make the proper calls (or is interrupted, or too slow, or has connection issues) the game won't render what the cloud is intending to send. It's why that Build 2014 physics-demo was called bogus, because in a real-world scenario the physics being rendered on the cloud would be completely and entirely dependent on the speed of the connection of the end-user. Someone with slow broadband or ADSL, would see the chunks of the building falling like a slideshow, or worse yet, rubber-banding around the play area. Even if all the end-user's connection was doing nothing more than working as a proxy for instruction sets, you would still need a zero-latency connection to ensure that the sets are arriving on time. I imagine the cloud will be more useful for productivity purposes on the Xbox One (e.g. game storage, game saves, video editing, streaming, media engagement, social services, etc.,) as opposed to actual game rendering. For the latter, everyone would need latency-free connections with very high bandwidth.